The G95 Pallet Inverter or Pallet Retriever style of transfer system was first developed in the mid 1980’s for use in cold storages, blast freezing warehouses or distribution related facilities exporting product. It was designed as an alternative to the conventional 180° Pallet Inverter, which did not offer ground loading or pallet separation capabilities at the time which later became an industry standard. With that, the G95 Pallet Exchange / Pallet Retriever was developed. As with all of the Premier Equipment, it incorporates a robust steel construction particularly suitable for the harshest environments including 24/7 operations pulling spacer dividers or exchanging pallets. By tipping the load on its side just beyond 90° it allows the load to rest on the skate table or side wall. 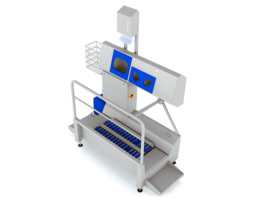 When the clamp is released from the top of the load it will allow the product to glide away from the pallet or load table enabling quick simple and safe pallet transfer, replacement or freezer blasting slat removal.